Today, selecting a new roof system might be as easy as finding the right certified contractor to install it for you. Several questions might come up, like which products and manufacturer to use. Typically, the best approach is to do some thorough research and I’m here to help explain the steps and guide you in the right direction. We’ll talk about picking and choosing the right sheathing, roof metals, underlayment, leak protection, and an asphalt system with their relative components to give your roof a great curb appeal and efficient protection. The first protective layer to any house is typically the sheathing, which you will most often find to be conventional plywood, synthetic decking, or particle board. The sheathing is fastened directly to the rafters, covering your attic or crawlspace. Older houses with shiplap (3 to 8 inch wide, tongue and groove boards) are typically sheeted over to create a solid substrate to nail the layers of your roof to so that the system can qualify for a manufacturer warranty. The purpose of using metals in an installation, is to protect the outermost edges of your roof from rot and to keep running water out of the valleys. Metal is usually 26 gauge and painted white, brown, or black for different accenting options, however, you can also have your metal ordered in other colors to perfectly match your color preferences. Once the sheathing and metals are attached, the next step is applying an underlayment. The two most common types are referred to as #15 or #30 felt paper (referencing 15 or 30 pounds per roofing square [100 ft ²]). This material is asphalt saturated and supplied in long runs, making it cost effective. A far better deck protection would be a synthetic underlayment, like IKO’s RoofGard-SB. This kind of material can greatly increase the life of your plywood deck while keeping moisture from getting into your house. Leak protection is the next critical component to a complete roof. National building code requires it to completely cover any roof section below a 3/12 pitch and along eaves in the northern regions. This helps keep wind-driven rain and standing water from ice dams from seeping into the attic and creating a significant problem. Most certified roofing contractors will, on the other hand, suggest placing this membrane among all critical leak areas of the roof (i.e. along rakes, in valleys, and around skylights and chimneys). IKO utilizes a glass fiber reinforced, self-adhesive membrane called StormShield in their roof systems, which meets most building code requirements and exceeds standard specifications for a quality product. 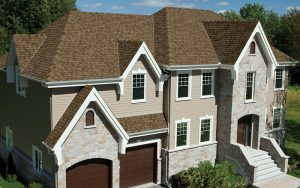 Composition roofing is the last product to top your roof off and is also one of the most noticeable pieces of your house, so choosing a style and color isn’t necessarily the easiest to do. One of the benefits of using a certified contractor is the selection process. Most will help you with the guess work and eliminate your need to dive into some extensive research about product comparison. The style of your new shingle will ultimately affect how your roof stands out. The latest, most popular style is the architectural laminate shingle, like the IKO Cambridge system. The premium designer systems, IKOs Armourshake, Crowne Slate, Grandeur, and Royal Estate can offer your house a long lasting, eye-catching addition to your home. A basic asphalt system is comprised of a starter course along the eaves and rakes, the main field shingles, and hip/ridge cap shingles to accent the prominent peaks. IKO offers an extensive line of products for a wide range of applications to suit your design needs, and a local certified contractor to get the job done right. As a local certified Puyallup roofing contractor, we’re here to help you select and install a quality roof system, and that’s why we’re a certified ShieldPro Plus+ Installer with IKO Manufacturing, Inc. We specialize in flat roof and composition systems for residential and commercial purposes. Call us at 253-445-8950 for a free estimate or drop by our website at http://www.chasenw.com. Great to see that you are supporting our local economy by installing IKO shingles that are made right here in Washington. Keep up the good work! Thank you. We definitely enjoy doing our part! Nice post. Thanks for sharing. Roofing companies Colorado springs also provides various types of quality roofing service. This is a very good post full of details and information on how to chose the right roof for homeowners and others. Good job! Allen. Good article on choosing a new roof system. IKO is a great product for roof leak protection. It’s good to see more and more roofing companies using this type of system.